So simple: Let there be light! And yet so complicated. Indeed, just what is light? 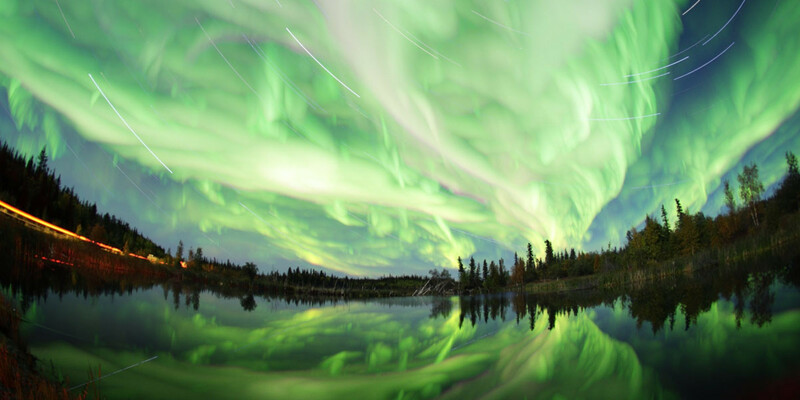 Northern Lights, By Kshitijr96 (own work) [CC BY-SA 3.0 (http://creativecommons.org/licenses/by-sa/3.0)], via Wikimedia Commons. 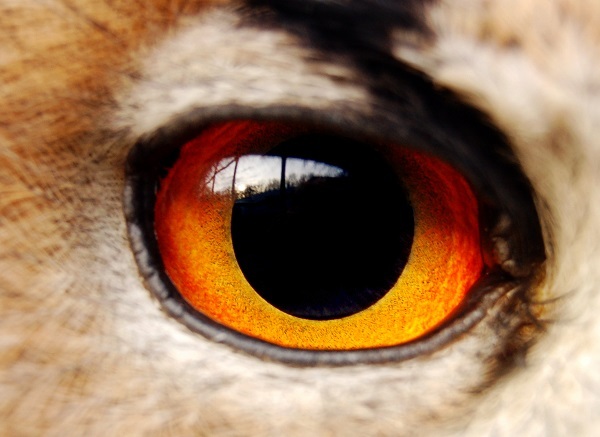 The eye is a photon detector. By Woodwalker (own work) [CC BY 3.0 (http://creativecommons.org/licenses/by/3.0)], via Wikimedia Commons. Light is a prerequisite for life, as it is the ultimate source of energy in our foods. Light is integral to religion, to creation stories, to poetry, to literature, to language, and to culture. Light is atmospheric beauty as in the sunrise and sunset, the rainbow, the aurora borealis, and the aurora australis. Light is a prerequisite for vision; in fact theories of light and vision have a convoluted history dating from the Greek and Arab philosophers. Vision requires light and optical devices such as glasses, contact lens, and laser refractive surgery can improve visual acuity. Light can diagnose and treat eye disease. The interaction of light and electrons in atoms or molecules is how light is detected. This is true for the photoreceptors in our retina and for the semiconductor detector elements in our cameras. Colors enrich our environment, stimulate and delight people in all lands, and adds beauty to our homes, our cities, and our lives. Sunlight, moonlight, and starlight benefit and add beauty and wonder to all of Earth’s people. Light is the foundation of our modern world; its generation, manipulation, transmission, and detection are integral to our communication, manufacturing, medical devices, public art, light shows, biotechnological instrumentation, educational programs, and laboratory instrumentation for the advancement of science and technology. Light is the source of information on the creation of the universe, on photophysical processes in the stars, and on the universal nature of physical laws throughout the universe. Light, through the tool of spectroscopy, led to our theoretical and experimental knowledge of the structure of atoms and molecules. Light and its interaction with matter led to the invention and the development of quantum mechanics. Light has occupied the minds of poets, philosophers (from the fifth century BCE), artists, scientists, and engineers. Today, light connects disparate people, cultures, and nations into the human family. Light fascinates, stimulates, and connects us. Children are amazed how sunlight is concentrated by a magnifying glass to kindle a fire. People are astonished when they look into a telescope or a microscope and see the microcosm and the macrocosm. Left: Sketch of the Whirlpool Galaxy as viewed from the Birr Castle Telescope (a 1.8 m reflecting telescope) by Lord Rosse in 1865. 2005 NASA/ESA digital image combination of a ground-based image from the 0.9-m telescope at Kitt Peak National Observatory and a space-based image from the Hubble Space Telescope (middle), and the Galaxy in infrared dust (right). Historically, light can be understood as a wave, as a quantum particle, and as a quantum field. Complicated? Yes! Indeed, the question “What is Light?” is often deferred to the question “How does light behave?”. More specifically, the question “What is light?” is often replaced by the question “How does light propagate and interact with matter?”. In this essay I point out some of the key conceptual origins of wave-particle dualism and theories of light-matter interactions in the early 20th century. I discuss the seminal contributions of Albert Einstein to our understanding of the nature of light and its interactions with matter. Einstein’s theories of relativity and their experimental confirmation made him popular worldwide; however, his contributions to the field of optics have transformed our understanding of light, as well as our ability to manipulate it for applications in a broad range of areas, including medicine, telecommunications, photonics, and experimental research on fundamental physics via Bose– Einstein condensates. His work on stimulated emission contributed to the development of the laser, a device that is transforming our world. Einstein’s publications on light influenced both Louis de Broglie and Erwin Schrödinger and led to the invention of “wave mechanics”. Einstein bridged the gap between the propagation of radiation in space and radiation-matter interactions. Between the years of 1905 and 1916, Einstein explained the interaction between light and matter by the absorption and emission of light quanta, thereby explaining several physical phenomena: Stokes’ rule of fluorescence, ionization of gases by ultraviolet light, and the photoelectric effect. In the photoelectric effect radiation of a threshold frequency is incident on a metallic surface and electrons are ejected; this principle is embodied in light detectors such as the photomultiplier tube. 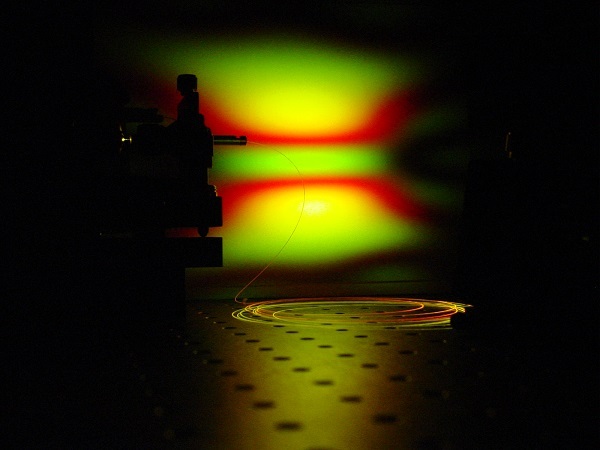 Einstein’s hypothesis of induced or stimulated emission is the basis of laser operation. It is both interesting and instructive to study the antecedents to Einstein’s work on light-matter interactions. In 1887, Heinrich Hertz, who generated, detected, and characterized propagating electromagnetic waves, observed that ultraviolet light incident on his spark gap resonators enhanced their capacity to spark. His assistant, Wilhelm Hallwachs, confirmed and expanded on this observation in 1888, when he demonstrated that ultraviolet radiation caused neutral metals to acquire a positive charge. In 1899, Joseph J Thomson studied the effect of ultraviolet radiation on the production of “corpuscles” [electrons] from a metal plate inside a Crookes tube. Thomson measured a current from the plate that increased with the frequency and intensity of the radiation. He was the first to state in a publication that the ultraviolet induced photoeffect results in the emission of electrons. In 1902, Philipp Lenard, who was working at the University of Kiel, demonstrated that the short wavelength radiation from a carbon arc lamp incident on a metal’s surface caused the emission of electrons. The number of electrons ejected, but not their kinetic energy, increases with the light intensity, and below a specific frequency of radiation no electrons are emitted. Lenard also observed that the maximum kinetic energy of the emitted electrons is independent of the intensity of the incident radiation, but it increases with increasing frequency of the incident radiation; he measured the effects of three different frequencies of ultraviolet light on the emission of electrons from an aluminium plate. In 1905, Einstein published a ground-breaking paper, “On a Heuristic Viewpoint Concerning the Production and Transformation of Light”, in which he deduced from Boltzmann’s statistical thermodynamics that the entropy of radiation described by Wien’s distribution law has the same form as entropy of a gas of elementary particles or quanta of energy, with each quantum proportional to the frequency of the corresponding wave. Einstein wrote: “Monochromatic radiation of low density (within the range of validity of Wien’s blackbody radiation formula [valid for hν / kT <<1]) behaves, in a thermodynamic sense, as if it consisted of mutually independent radiation quanta of magnitude [hν],” the symbol h being Planck’s constant, k the Boltzmann’s constant and T the Kelvin temperature, and ν the frequency of the light. Furthermore: “When a light ray spreads out from a point source, the energy is not distributed continuously over an increasing volume, but consists of a finite number of energy quanta that are localized at points in space, move without dividing, and can only be absorbed or generated as complete units.” Einstein alternatively uses the words energy quantum (Energiequant) and light quantum (Lichtquant). This concept of discontinuous energy in propagating radiation contradicted Maxwell’s continuous wave theory of electromagnetic radiation. A decade later, in 1916, Einstein discussed the momentum p=hν/c and the zero rest mass of his light quantum in his publication: “Emission and Absorption of Radiation in Quantum Theory”, Deutsche Physikalische Gesellschaft. Verhandlungen 18, 318. The American physical chemist Gilbert N Lewis constructed the name photon in a paper published in the journal Nature in 1926. “It would seem inappropriate to speak of one of these hypothetical entities as a particle of light, a corpuscle of light, a light quantum, or light quant, if we are to assume that it spends only a minute fraction of its existence as a carrier of radiant energy, while the rest of the time it remains as an important structural element within the atom... I therefore take the liberty of proposing for this hypothetical new atom, which is not light, but plays an essential part in every process of radiation, the name photon.” After Lewis proposed the term "photon" in 1926, many physicists adopted it as a name for Einstein's light quantum. However, Lewis' conception of the photon was completely different from Einstein’s. As H Kragh discovered, the name photon was proposed by at least four scientists before 1926. The only vestige of Lewis’s photon that remained valid was its name. Further historical insights are found in Lamb’s 1995 publication, “Anti-photon”. Albert Einstein in 1921 by F Schmutzer [public domain], via Wikimedia Commons. Einstein applied his concept of the light quantum to explain the photoelectric effect, which Maxwell’s wave theory could not explain. 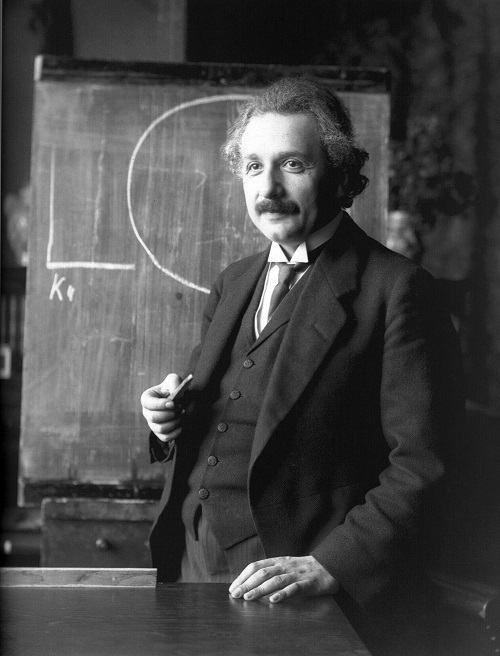 Einstein wrote: “If monochromatic radiation behaves … as though the radiation were a discontinuous medium consisting of energy quanta of magnitude hν, then it seems reasonable to investigate whether the laws governing the emission and transformation of light are also constructed as if light consisted of such energy quanta.” Einstein assumed that light interacts with matter by the emission or absorption of his posited light quantum, and he posited a new mechanism for the perplexing phenomenon. Einstein described his theory of the photoelectric effect as follows. Light quanta penetrate the surface layer of matter, and their energy is converted into the kinetic energy of the electrons; a light quantum transfers its entire energy to a single electron. He wrote: “An electron in the interior of the body will have lost part of its kinetic energy by the time it reaches the surface.” In addition, he assumed that the electron at the metal’s surface must perform work Φ, (a function of each material, called the work function), to overcome the attractive forces holding it in the material in order to leave the surface; the maximum kinetic energy of such electrons is hν–Φ. In modern notation: eV=hν–Φ, where e is the charge of the electron and V is the retarding potential necessary to stop the fastest photoelectrons. This is the first equation in the quantum theory of radiation-matter interactions. Confirmation of Einstein’s posited photoelectric effect came in 1912, when Arthur L Hughes measured the maximum velocity of photoelectrons from various metals and verified Einstein’s photoelectric equation. The first confirmation of the quantum hypothesis, in an area of physics other than radiation, occurred in 1907 when Einstein explained and demonstrated that energy quantization can be applied to condensed matter. Einstein explained the anomalous temperature dependence of the specific heats of solids (i.e. that they decreased with reduced temperature) by modelling a solid as a lattice of quantized oscillators. Einstein’s formula was in good agreement with the experimental results provided in 1910 by Walther Nernst and his assistant Frederick A Lindemann. Einstein’s 1922 Nobel Prize in Physics cited his 1905 paper on the photoelectric effect: “For his services to theoretical physics, and especially for his discovery of the law of the photoelectric effect.” At the time that Einstein developed his theory of the photoelectric effect, many of the world’s eminent physicists such as Max Planck, Hendrik A Lorentz, Max von Laue, Wilhelm Wien, and Arnold Sommerfeld could not accept his quantum theory of light because they cited the interference of light, which is consistent with wave phenomena. Both Planck and Lorentz accepted that radiation interacts with matter in a quantized process, but rejected the concept that individual light quanta are propagated as a wave. One notable exception was Johannes Stark, who in 1909 proposed localized energy quanta in X-rays, and he also supported Einstein’s light quantum hypothesis. Einstein himself realized that his hypothesis required experimental validation or rejection, and at the 1911 Solvay congress he stated: “I insist on the provisional character of this concept [light-quanta].” In 1921 Maurice de Broglie reported at the third Solvay Conference in Brussels that his analysis of the impact of X-rays on matter and the subsequent ejections of electrons could be explained by assuming the X-rays have an energy hν. His brother, Louis de Broglie, read Einstein’s papers on light and following Einstein’s concept of light quanta derived his theory of “matter waves.” Erwin Schrödinger built on the prior derivations of Louis de Broglie in his invention of “wave mechanics”. 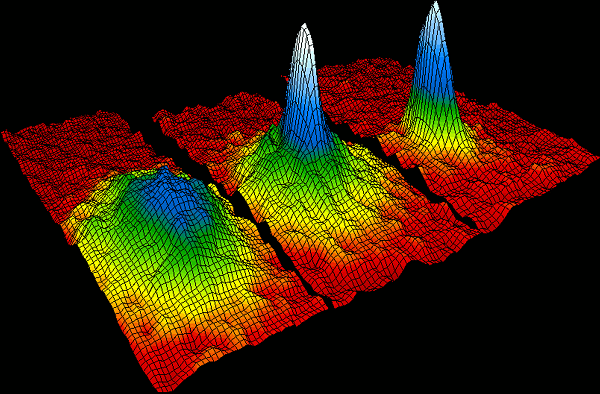 Bose–Einstein condensate. Velocity-distribution data (three views) for a gas of rubidium atoms, confirming the discovery of a new phase of matter, the Bose–Einstein condensate. Left: just before the appearance of a Bose–Einstein condensate. Center: just after the appearance of the condensate. Right: after further evaporation, leaving a sample of nearly pure condensate. By NIST/JILA/CU-Boulder (NIST Image) [Public domain], via Wikimedia Commons. In 1916, Robert A Millikan experimentally verified Einstein’s photoelectric theory with high precision, extending the previous experiments of Lenard. Millikan showed that the maximum kinetic energy of the emitted electrons is proportional to frequency. His plots of the stopping voltage for photoemission versus the frequency of the incident radiation followed Einstein’s predicted linear dependence, and for different metals the values of h were equal to the value that Planck calculated in his 1901 paper. Millikan also showed that the number of photoelectrons is proportional to the intensity of the radiation. Nevertheless, he rejected Einstein’s posited light quanta. Nine years after Einstein conceived of the light quantum, he returned to the problem of light-matter interaction, specifically, the transitions between energy states of atoms and the role of light quanta in these processes. In 1916, he postulated stimulated or induced emission in his seminal paper “Emission and Absorption of Radiation in Quantum Theory”. This paper is notable for its introduction of a probabilistic approach to quantum physics. It contained his so-called “A and B coefficients”, and his prediction of the process of induced emission or spontaneous emission. At that time, the concept of energy transitions in atoms mediated by the absorption and the emission of light quanta was not commonly accepted by the physics community. Bohr’s theory of the hydrogen atom did not utilize the idea of the photon; in fact, Bohr rejected that concept until the early 1920s. Note that even Max Planck, who is considered to have founded quantum theory in 1900, did not accept the reality of quantization until 1913 when Bohr quantized the energy levels of the hydrogen atom. The first ruby laser is disassembled. Einstein reasoned that the radiation field can cause a loss or gain of energy in the atoms. He assumed a process with two energy states for the atom, upper and lower, and transitions between the two with an absorption or an emission of a photon of energy equal to their energy difference. If an atom absorbs a photon then its electronic energy will be increased by the energy of the photon and the atom will be in an excited energy state. An atom in the excited energy state can spontaneously emit a photon and will now exist in a lower electronic energy state or the ground state of energy. The energy of the emitted photon is equal to the energy difference between the excited and the ground electronic states. Spontaneous emission from the excited state of an atom can occur in the absence of incident radiation. In induced, or stimulated, emission, an atom in an excited state interacts with an electromagnetic field, causing an electronic transition from the excited energy state to the lower energy state; the energy difference between the two states is transferred to the electromagnetic field. The photon created in the process is identical in frequency, phase, polarization, and propagation direction to the photons in the incident field. Einstein assumed a collection of atoms in thermal equilibrium. He assumed a process with upper and lower energy states and transitions between the two with an absorption or an emission of a photon of energy equal to the energy difference between the two energy states. The number of atoms in the upper and the lower states are constant. At thermal equilibrium, the same number of atoms per unit time will absorb radiation as the number that will emit radiation. Einstein then distinguished between two types of transitions. The first is when the emission of radiation occurs in the absence of external influences. He made the analogy to Rutherford’s law of radioactive decay. In modern terms, this is the process of spontaneous emission, which occurs when no external radiation is present, and is characterized by “Einstein’s A coefficient”. The resulting photon can be emitted in any propagation direction. The second type of transition is due to the interaction between the atoms and incident radiation. Einstein assumed that the effect of the incident radiation is proportional to the radiation density and causes the transition between states. Einstein assumed the principle of microscopic reversibility, which states that the rate of energy transfer from lower to upper states must equal that from upper to lower states for every transfer, can be applied to radiation in equilibrium. Einstein required that the process of stimulated emission occur in order for the energy levels of an atom in equilibrium with the radiation field to be given by the Boltzmann distribution and to be consistent with the Planck radiation law. If the Einstein coefficient for stimulated emission (Einstein’s coefficient) was zero, there would not be a Boltzmann distribution of states at thermal equilibrium. At thermal equilibrium, the number of atoms gaining energy must equal the number losing energy. He deduced that the probabilities of induced absorption and emission are equal. The Einstein coefficients are independent of radiation density. Einstein presciently suggested that the coefficients A and B could be calculated if a new version of electrodynamics and mechanics was available that is in agreement with the quantum hypothesis (a new quantum mechanics). This prediction was fulfilled in 1927 when Dirac used his version of quantum mechanics to derive in one paper Einstein’s B coefficients and in a second paper Einstein’s A coefficient (spontaneous emission). Supercontinuum generation in a photonic crystal fibre. Courtesy of J Dudley, Chair of the Steering Committee of the International Year of Light 2015. Experimental verification of Einstein’s concept of stimulated emission came decades after Einstein theoretically predicted it. Bertolotti posits an explanation for this long delay in his article: Why was the laser invented so late? See the ICO Newsletter, January 2010, Number 82. In 1954, Gordon, Zeiger, and Townes invented the maser (microwave amplification by stimulated emission of radiation), which operated in the microwave region. 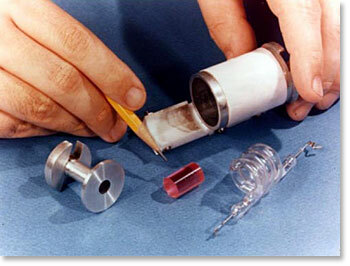 And, in 1960, Theodore H Maiman produced stimulated emission in a ruby crystal as a component of the first laser. The 1964 Nobel Prize in Physics was shared by Charles H Townes, Nicolay G Basov, and Aleksandr M Prokhorov for their independent work on the laser. So the question remains: What is Light? Einstein conceived of the photon as a state of the electromagnetic field with a frequency ν, a wave vector k, an energy hν, and a momentum ħk. It is a particle of zero rest mass, it has spin one, and it has two states of polarization. In 1924 Einstein wrote: “The positive results of the Compton experiment proves that radiation behaves as if it consists of discrete energy projectiles, not only in regard to energy transfer but also in regard to momentum transfer.” So after all these years we come back to the statements: “Radiation...behaves...as if it consists of...” Statements addressing not What is light? but, rather, How does light behave?. Although we have not answered the original question, our increased understanding of light has brought beauty to our lives and has transformed our world. Thank you for light. Professor Barry R Masters received a PhD from The Weizmann Institute of Science, Israel, a MS from The Florida State University, and a BS from The Polytechnic Institute of Brooklyn. Professor Masters was a Visiting Scientist, in the Department of Biological Engineering, at the Massachusetts Institute of Technology, a Visiting Scholar in the History of Science Department at Harvard University, a Visiting Professor, Department of Ophthalmology at the University of Bern, and a Professor in Anatomy and Cell Biology at the Uniformed Services University of the Health Sciences. He is a Fellow of the American Association for the Advancement of Science (AAAS), the Optical Society of America (OSA), and SPIE. From 1999 to 2000, Professor Masters was a AAAS Congressional Science & Engineering Fellow and served as a Legislative Assistant in the United States Congress. He is a Recipient of The Vogt Prize for Ophthalmic Research (Highest Swiss Award for Research in Ophthalmology) with Dr Böhnke in 1999 for their work on: “Confocal Microscopy of the Cornea”. Professor Masters has published 86 refereed research papers and 143 book chapters and proceedings articles. 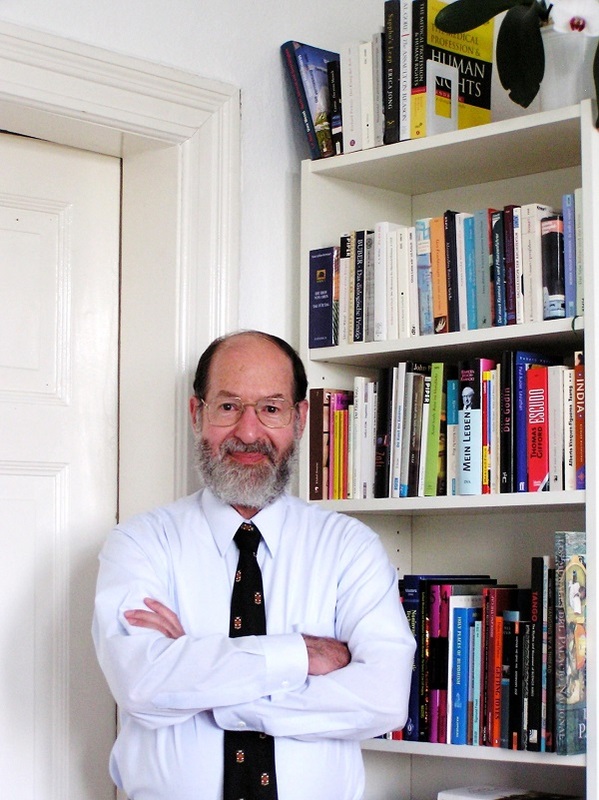 He is the editor or author of 10 books: Noninvasive Diagnostic Techniques in Ophthalmology; Confocal Microscopy and Multiphoton Excitation Microscopy: the Genesis of Live Cell Imaging; Handbook of Biomedical Nonlinear Optical Microscopy (with Peter So). He is writing a new book to be published by Springer Nature: Superresolution Optical Microscopy: The Quest for Enhanced Resolution and Contrast. He lectures worldwide on the responsible conduct of research, biomedical ethics, critical thinking, and biomedical photonics. William T Rhodes, Florida Atlantic University, USA.